Outlook Flags can be very helpful as part of your Email triage process. They provide an additional visual cue as you scan your inbox messages. You can also use the flag field in the inbox as a way to view, sort or organize your messages. You can even create a custom search folder or custom view so that you can focus some of your designated triage time on just your flagged messages. To indicate that you have briefly looked at the message and determined that it needs further, detailed review. To note that the message can be answered at a later time. To signify that the message requires some specific actions or additional follow-up activities. To set the message with a date-based flag with a specific start-date, due-date, or both. Many Email systems are very flexible and even allow you to highly customize the various flag settings. Use flags of different colors, and even define your own colors. Create different types of flags (follow-up, informational, etc.). Set a flag with a specific start-date, due-date, or both. Set flags with reminders, so that you receive a pop-up reminder (similar to your appointment reminders) for that message on the specified date. In Outlook, you can also set Follow-Up Flags for either yourself or the recipient. For Yourself – To remind yourself you need to follow-up on a specific message. For the Recipient – To inform a recipient they need to respond by a specific date. (Note: This feature should be used with discretion, as many people may not appreciate receiving an e-mail message with a reminder date already set). You can even use Outlook Rules to automatically add flags to certain messages that meet specific criteria. For example, you can create an outlook rule that puts a flag on any message from your manager or that contains specific keywords. As you can see, there is a LOT of potential functionality associated with flags. So, how do you get the most value from their use? Flags can be very helpful when used as a select part of your Email triage and processing workflow. Be realistic in your ability to set and track large numbers of flagged messages. If you end-up with everything flagged, then they are not really adding any value. 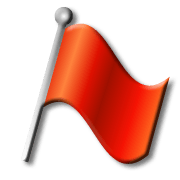 Do not use flags with due-dates in place of a true task management or project management system. Be careful in assigning follow-up flags to recipients. This practice can be useful, but should be discussed and agreed-to ahead of time by all parties involved. You need to define rules with respect to when and how this will be used, and expectations with setting and adhering to the requested dates. Consider using tasks instead of flagged messages with due dates, since using flags with dates on messages may result in you keeping large numbers of messages in your inbox as to do reminders. If you do use messages with due-by dates, consider placing them in a separate follow-up folder under your inbox. I have an outlook rule that automatically flags messages from my manager or any of my senior leaders. This gives me a quick visual way to quickly identify these messages when scanning my inbox for messages. I do not use flags with start-dates, due-dates, or reminder-dates. Instead, I use the tasks feature for items that have date-specific follow-up requirements. I flag messages that I send, forward, or reply to when I need to ensure that I receive a response. I often do this when I delegate an important item to someone else or e-mail someone for important information I require for a project or activity. I created a flagged messages search folder that I have added to my favorites folder. It creates a dynamic view of any flagged messages in either my Inbox or Sent Messages. I review my flagged messages search folder as part of my daily triage review sessions. This allows me to quickly identify any items that meet any of my flag criteria; messages from my manager, messages that I need to review in more detail, or messages that I have sent/forwarded/replied to where I am still awaiting a response. When I receive a requested response or confirm an item I delegated was completed, I remove the flag from the message in my sent messages folder. This way, it no longer shows-up when I review my flagged messages search folder as part of my triage review. I usually do not need to adjust the flags I have set on other types of messages, since the message will either get deleted or filed to a folder, and my search folder criteria only looks at my inbox and sent messages. This way, a flagged message always remain visible during my triage review session until it gets deleted, filed, or I specifically clear the flag myself. As with tasks, categories, and other Email features, it is best to use follow-up flags selectively and not overuse them, or you start to dilute their use. I also encourage people to experiment with flags and determine how they fit best within your own inbox processing and triage routines. Please feel free to share your experiences (good and bad) in utilizing Outlook flags below. Photo red flag courtesy of Microsoft Image Gallery.